Artfully arranged in baskets with hand-lettered chalk signs, a seasonal variety of fresh produce ranging from berries and sweet cherry tomatoes to bunches of leafy greens, piles of string beans, and ears of fresh corn weigh down the tables of the farm stand every week at Jeanes Hospital. In addition to the produce, the stand sells jars of homemade jams, raw honey, applesauce, and nut butters. A cooler full of fresh, cage-free eggs and goat cheese rounds out the stand’s w eekly offerings at its location near Lot C between the Jeanes Hospital and Fox Chase Cancer Center campuses. 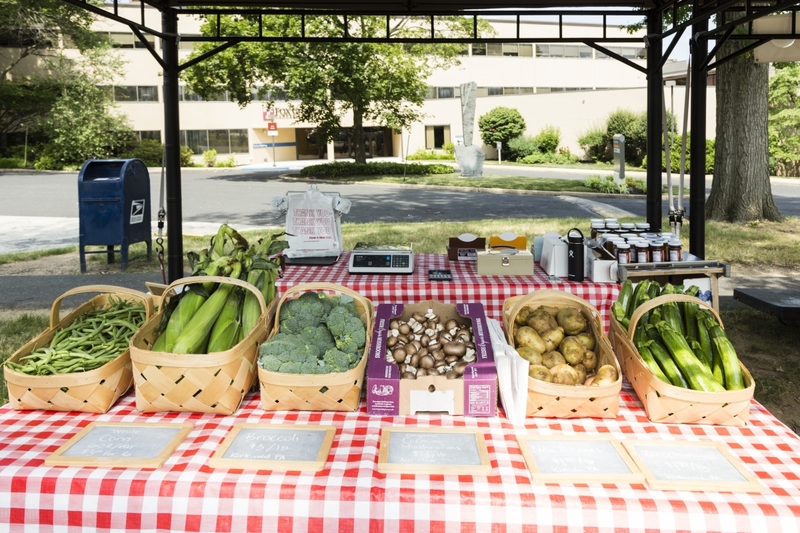 Now in its fourth year, the farm stand, although small, boasts a wide variety of seasonal goods and is attracting a loyal following of both community members and employees of Jeanes and Fox Chase. “It keeps growing every year,” said Nancy Baumann, director of nutrition and hospitality at Jeanes and Fox Chase. Each week, more and more people from the community come to scoop up the fresh produce, with their reusable shopping bags in tow. The stand is open every Thursday from 11 a.m. to 5 p.m. during May through November, and proceeds benefit the Jeanes Hospital Auxiliary, which also operates and manages the stand. On rainy days, the stand moves indoors into the Jeanes cafeteria. In the spring, plants and herbs are available for purchase, and come October, pumpkins will give the stand some festive fall flavor. The produce available for purchase also changes seasonally as the farm stand sells what local farmers grow. The Common Market, a North Philadelphia-based nonprofit that works with hospitals to help them procure local sustainable foods, serves as the distributor. The nonprofit cultivates relationships with local farmers so that vendors need only place an order and The Common Market takes care of the rest, said Jillian Dy, deputy director of The Common Market Mid-Atlantic. “We are that middle step between the farm and the hospital,” said Dy. Many of the farms with which The Common Market works are organic, and all use sustainable methods and treat workers fairly. At the Jeanes farm stand, once LeFever places and confirms an order, The Common Market picks up the produce from local farmers and delivers it to the farm stand on campus. As part of maintaining the sustainable mission, any food that does not get sold at the farm stand is incorporated into the recipes in the Jeanes cafeteria, either in the salad bar or hot food items. “Nothing ever gets thrown out,” said Baumann. The farm stand was started after the trend of eating locally sourced food began to gain steam. Jeanes is part of the Good Food Healthy Hospitals initiative, which asks hospitals to take the lead in offering healthier food options in cafeterias and employee meals. The stand, with healthy, fresh, locally grown food, fits right in.